The annual co-curricular festival of Manipur Institute of Technology (MIT) Week 2018 came to an end at its campus of Takyelpat in Imphal on Saturday. As part of the concluding function, prizes were distributed to the first, second and third position holders in various sports (indoor/outdoor), literary and cultural competitions. Newly appointed administrator Jarnail Singh of Manipur University and principal in charge of MIT Prof R K Hemakumar Singh also attended the valedictory function. Addressing the function, administrator Jarnail Singh said that there is lot of scope for hard work and dedicated students of engineering as engineering is like a broad highway. Students of this stream can go in different fields and Master in Technology students can do specialization in many areas. Encouraging the students, the former chief secretary of Manipur also asked the students not to hesitate to go outside the State. The world is so big and offers many opportunities. So, grab it with sincere efforts, added Jarnail Singh who himself was a student of engineering before he joining the Indian Administrative Service. 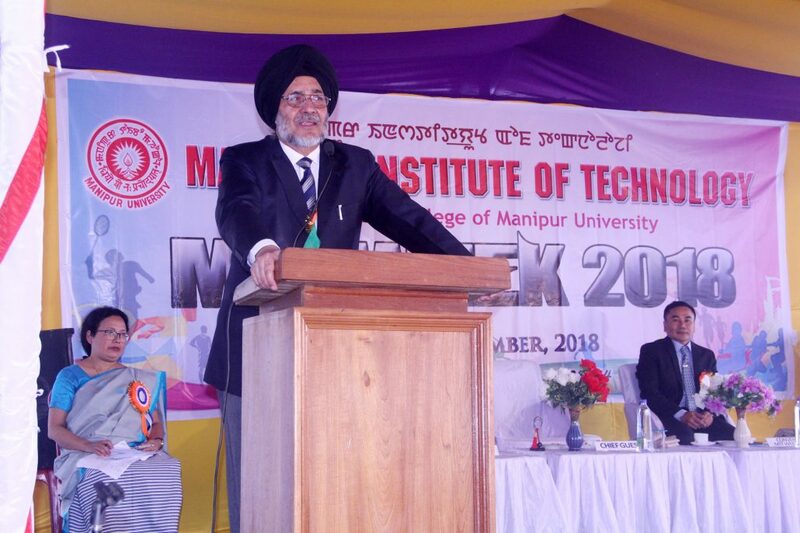 In his keynote address, convenor, MIT Week 2018 Dr N Basanta Singh informed that the MIT (erstwhile Government College of Technology) was established on August 28,1998 by the Government of Manipur as Pioneer Engineering College in the State. On December 31, 2003, the College was renamed as Manipur College of Technology. Further, the Institute was renamed as MIT since 2005. MIT became a constituent college of Manipur University with effect from October 13, 2005. The institute is offering BE and M Tech Programs in Civil, Electronics & Communication and Computer Science & Engineering etc. So far, the institute has produced more than 1200 graduates. It may be mentioned that the MIT Week 2018 was started from November 12, 2018.